First Ever Eclectic Voices Reading Festival is Here! The Eclectic Voices Writers Group has been toiling away all year long, and now the time has come – the first ever Eclectic Voices Reading Festival has arrived! Featuring readings of SIX new plays by our writers, developed over the course of the past year, September through June, the reading festival is a casual public sharing of these fresh new works. Everything is still a work-in-progress, so each reading will be followed by a talkback with the author. Refreshments will be available, and all readings are FREE (though donations are accepted). 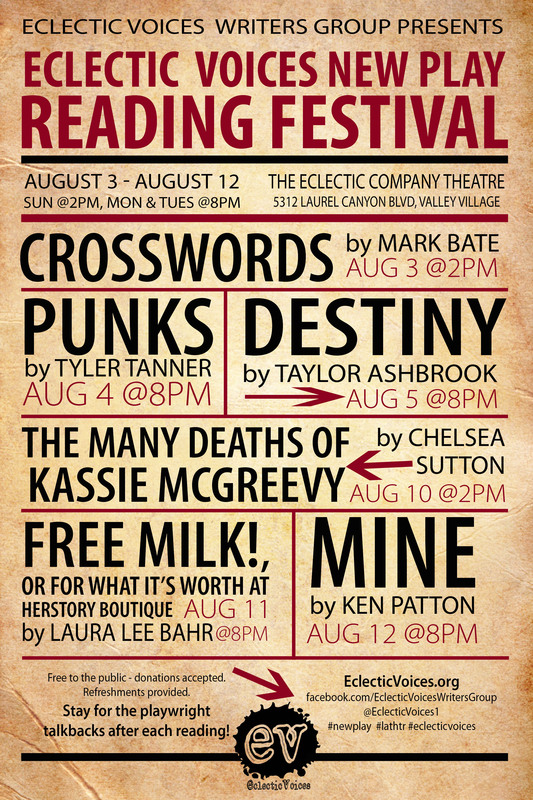 Sunday, August 3, 2014 at 2:00 p.m. “Crosswords” by Mark Bate. A comedy disguised as a possible mystery about a murder that may or may have not occurred. Monday, August 4 at 8:00 p.m. “Punks” by Tyler Tanner. Set during 1983 in the remote woods of East Texas, a group of troubled pre-teen boys find themselves in a juvie “brat camp” as a final chance before their actions have permanent consequences. Centered around Tim, he not only learns the ramifications of his actions but the value of friendship from a rag-tag bunch and discovers that being different isn’t so bad after all. Tuesday, August 5 at 8:00 p.m. “Destiny” by Taylor Ashbrook. Something horrible happened a long time ago, and Maureen’s been doing penance ever since. Haunted by her shame and seeing no joy in her future, she plans to escape her grim existence, luring a mysterious stranger into her scheme, only to be confronted by her past in a way she never anticipated. Sunday, August 10 at 2:00 p.m. “The Many Deaths of Kassie McGreevy” by Chelsea Sutton. Kassie McGreevy is just a normal girl with a not-so-normal problem: she keeps dying and resurrecting. But what’s causing it? And why does she need a cupcake when she wakes up? And why does a cancer patient need her help to rob a bank? Monday, August 11 at 8:00 p.m. “Free Milk!, or For What It’s Worth at Herstory Boutique” by Laura Lee Bahr. While writing her next work, an impoverished author becomes saboteur, thief, and patron of a store that puts a price on the sentimental objects of “herstorically” significant women. Tuesday, August 12 at 8:00 p.m. “Mine” by Ken Patton. An exploration of the intricacies of love and relationships as a woman explores the adage that there are no limits to what a person will do in the name of love. Best of luck with your event. Many thanks for returning to my blog. Glad you are enjoying the posts. Come back any time. This entry was posted on July 28, 2014 by Eclectic Voices in Blog and tagged #eclecticvoices, #lathtr, #newplay, #newwriter, Arts and Entertainment, Chelsea Sutton, festival, ken patton, Laura Lee Bahr, mark bate, reading, Taylor Ashbrook, Tyler Tanner, writing.